The summer solstice does not only mark the start of the new season, but it has also been adopted as one of the main celebrations in the yoga community: The International Day of Yoga. As 2018 is the fourth year that we commemorate this important date, we think that a yoga festival is a perfect idea to celebrate the occasion. Yoga festivals are filled with joyful souls, lots of sunshine and happy faces. At these events, you can join an amazing group of people, make new friends, and have a great time with music, food, dance, meditation, workshops, lectures and all sorts of yoga sessions guided by the most qualified instructors in the world. Is there a better way to honor our beloved yoga practice on its day? Here is a compilation of the 5 best yoga festivals this summer for you to rejoice in the high spirits of the season. Let’s delight our mind and body with a fun atmosphere and throwing a big party for yoga! 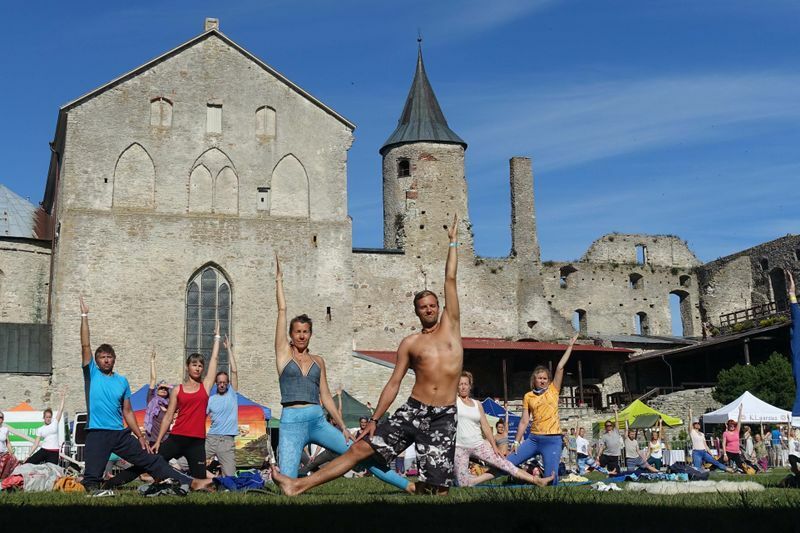 Yoga and music fans will head to the annual Flovibe festival for chill vibes and amazing yoga and Pillates classes. Be among the beautiful faces in the crowd in the lovely setting of Stansted Park and you will be in for the time of your life! 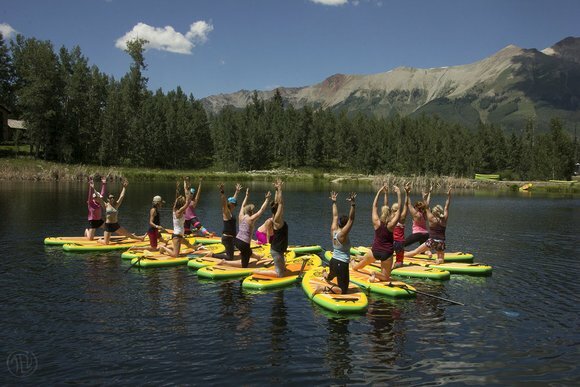 Activities: The Flovibe festivals has a wealth of relaxing and challenging activities for all yoga-minded people. You can choose between meditation sessions, yoga sessions, Pillates classes, workshops and talks delivered by yoga experts from across the world, and much more! The chic food trucks will also help you feel pampered and enjoy what will probably be the highlight of your summer days for this year. Accommodation: Everyone is welcome to set up their tent on the camping grounds of the Stansted Park in Hampshire. The grounds will be reserved only for festival goers. 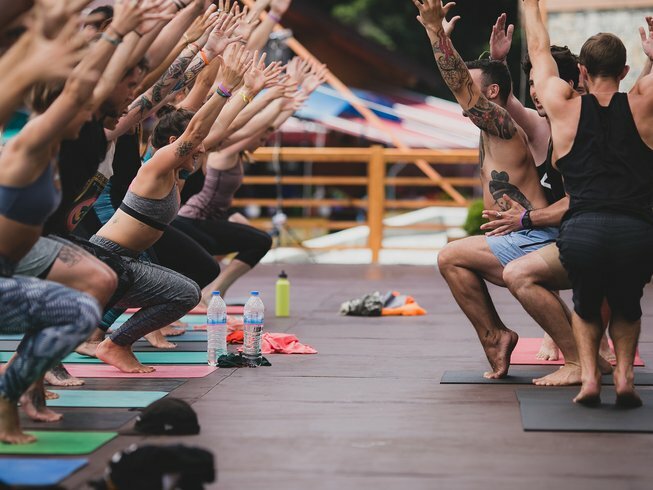 This festival brings together a remarkable group of yoga and meditation instructors, musical performers, speakers, and artists for a unique experience to get into your mind, body and soul. And being part of the Wanderlust festivals, it guarantees to fulfill all expectations. And if you can’t travel to Canada, check out their Wanderlust: 108 Festival that tours all over the world, I went to one last year and had an awesome time. Are you a fan of Hatha yoga, or just a yoga beginner looking for an amazing experience? Then this yoga festival situated in the heart of an UNESCO world heritage city should be your next destination for the summer. The beautiful medieval fortress of Talinn is one of Estonia’s most enticing sights; and guess what: you will enjoy accomodation right in the spectacular Episcopal Palace of Kau Manor (featured above). Location: Kau Manor, Talinn, Estonia. Activities: Every day, you will enjoy morning and evening rituals of yoga, as well as numerous Pranayama and Hatha yoga classes to choose from during the day. The retreat includes the price for entrance to the 7 day International Yoga Festival of Talinn, where you cna go and mingle with the other festival goers and enjoy the music and exquisite yoga classes the festival offers. Accommodation: The festival participants will be hosted in the Kau Manor of the Episcopal Palace, right outside of the historical city of Talinn. You can opt for a provate double room for 1 person, a private double room for 2 persons, or a place in a shared room. All of the rooms are in a shared villa type of setting. 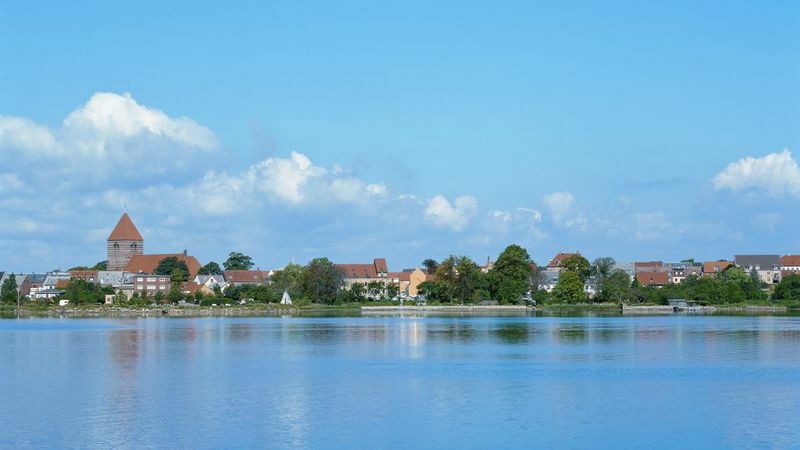 The 6th edition of the One World Festival on the beautiful island of Møn is going to be an unforgettable experience. 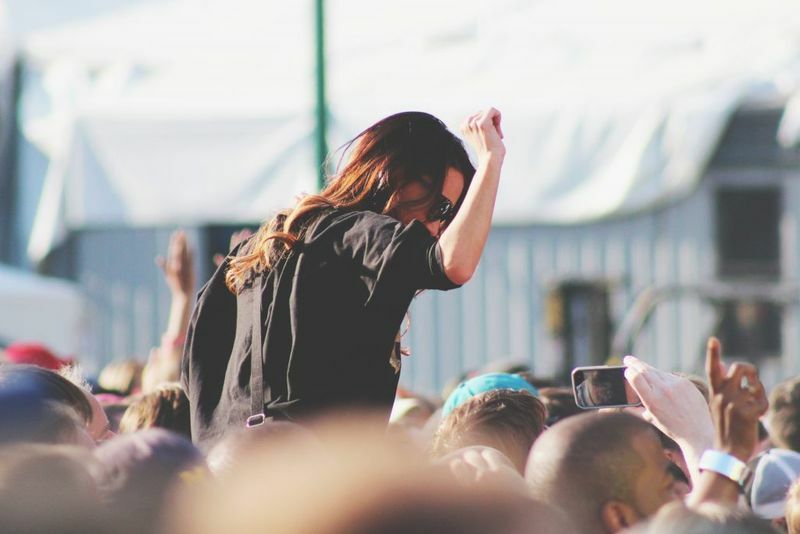 Live folk and rock music, good vibes, healing meditations, yoga practice and walks around an amazing landscape are just a few of the things that will change your summer. Location: Island of Møn, Denmark, Europe. Activities: relaxing meditation sessions, shamanistic meditations, healing and welness yoga practice, aerial yoga with Boban Krstic, cacao ceremony with a live band, daily vegeterian meals. Accommodation: 4 nights accomodation in a shared lartge tent or a double room within a shared large tent. Om and bass is probably going to be the most fun event of the summer. The organzers bring together all hollistic therapies, meant to recharge your energy centers and chakras through relaxation and emotion. You will be able to enjoy live music, dancing, art therapy, contact impro, Hatha yoga, kirtan, martial arts workshops as well as quiet outdoor lounges for relaxing and talking with your friends. Location: Oxfordshire, Oxford, United Kingdom. 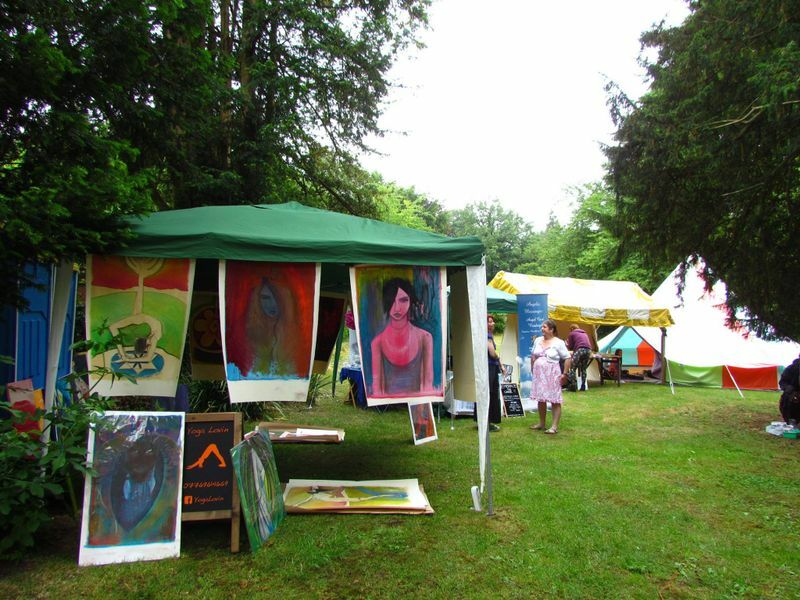 Accommodation: For your 2 nights accomodation you can choose between sleepingin your own tent on the grounds of the Braziers Park (extra bonus points for the wonderful glamping setting) or gettign a room in a shared manor just along the festival location. Price: From 211 USD for camping in your own tent, or from 448 USD for a place in shared manor. Ready to kickstart your summer with a yoga festival? Go to BookYogaRetreats.com and find the one you like the most! We guarantee that you won’t say any of these 5 things after you go to a yoga fest.